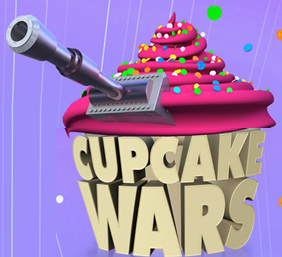 Cupcake Wars is a Food Network reality-based competition show hosted by Justin Willman based on creating unique and professional-style cupcakes that began airing in June 2010. The show is similar to its successful Chopped show in that it starts with 4 contestants who are eliminated one by one in 3 rounds. During seasons 1-3, the show’s time-slot was Tuesdays at 8 pm, EST, but at the beginning of the 4th season, the time-slot changed to Sundays at 8PM EST. The show also challenges its contestants to create cupcakes with unusual ingredients with the winning team receiving $10,000. Each team consists of a chef and a sous-chef. Cupcake Wars is currently airing its seventh season.